Sally Ann Quintanilla obituary. Carnes Funeral Home. Nov 30, 2018 Praying for all the family and I know it’s a very difficult time for all. I am a friend of Fran Franco and our church has been praying for Sally and we shall continue to pray for all of you. May God bless and comfort this family. 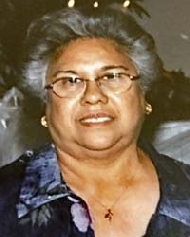 Sally Ann Quintanilla, 81, passed away at her home in Friendswood, Texas on November 27, 2018 after a long illness. She was surrounded by her loving family. Sally was born on August 1, 1937, in Galveston, Texas, to Alice Moreno and James Castro. She attended Ball High School in Galveston. During her life she worked at Wieners, Food Giant and The Fair in Texas City. She also worked and was a member at Shrine of the True Cross Catholic Church in Dickinson, TX, which she said was the most rewarding work. Sally is preceded in death by parents. She is survived by daughter, Alicia Howard; beloved sister, Virginia Vargas; grandchildren, Elton, Matthew and Haley Howard; great-grandchildren, Payton, Melissa, Tyler and Matthew Jr.; nieces, Lillian Quintanilla, Frances Franco, Becky Vargas, Rachel Wall and Becky Gibbs; numerous grand nieces and nephews and great-grand nieces and nephews. The family wishes to thank the staff of Encompass Hospice, V&R Healthcare for their compassionate and professional care they provided to Sally. A special thank you to Edith Rodriguez, her primary healthcare provider and Tonya Schepis, hospice volunteer. The family would also like to send a special thank you to her niece, Frances Franco; her sister, Virginia Vargas, for their weekly visits that brightened her day more than you will ever know. Also, a very heartfelt thank you goes out to the Alvarado, Franco, Quintanilla, Gibbs and Wall families for all their visits, love and support. Pallbearers are Elton D. Howard III, Matthew B. Howard, Nathan A. Franco, Junior Alvarado, Abel Ray Quintanilla and Zeke Contreras. Visitation and Services will be held on Saturday, December 1, 2018 at Carnes Funeral Home-Texas City, starting at 9a.m. with 10a.m. Funeral Services followed by Interment at Mt. Olivet Catholic Cemetery in Dickinson, Texas.